It's time for Arctica ! And sleighs made of ice ! That's exactly the two images. cool. May i then propose an event? 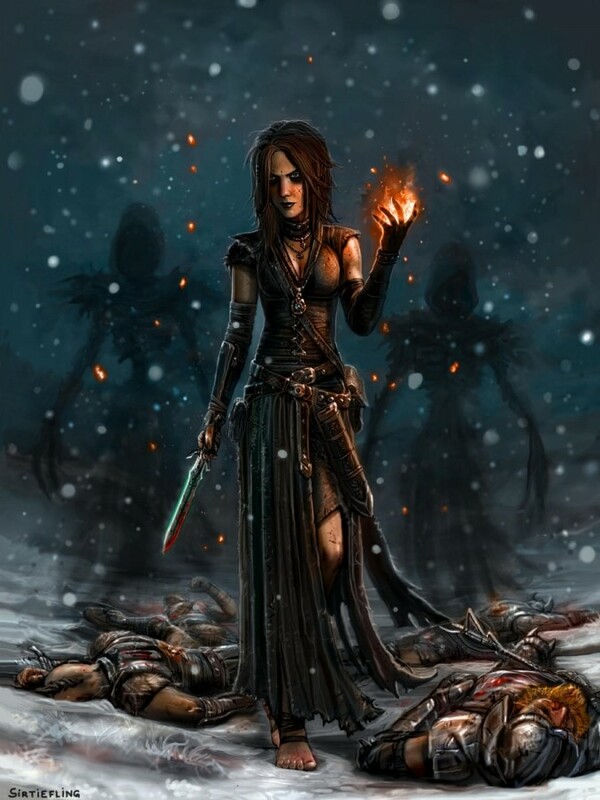 A daemon of envy heard of the sword that symbolizes the alliance between Ukray and the ice elves. As is in his nature, he tried to steal the sword, maybe succeded, maybe even killed the one that held it last and retreatet to a cave near a frozen lake on askland territory. So maybe it would be a diplomatic problem to send armies to get it back. Maybe its more a job for a selected few heroes, but that raises the possibility that someone dies on the job. How did you get it back? did some tragic hero die on this day? What implications did this event have on your alliance? did it get weakened or even stronger? Did you anger the asklanders? Did someone else use this moment of weakness? How dis you call this lake after the event? I hope im allowed to propose this. If not, just ignore it. Have you thought about a name for a pleasure daemon? If so, can you give it to me for fluffing? I gave you below the story that inspired me. Everyone can help me create this story. What do you think about your idea? Does placing this surviving demon of the 8th age in the volcano suit you? "And : @Theokrit idea of inventing a story that would involve a lord of the dark god or a demon and our different people. His story turn around the alliance of Ukray and ice elves. Here is what I imagined. This is a first idea and I would love to have yours. A Åsklander lord in the service of a demon wants to destroy the Tava Valassë to allow black magic to cover the world and gain power. 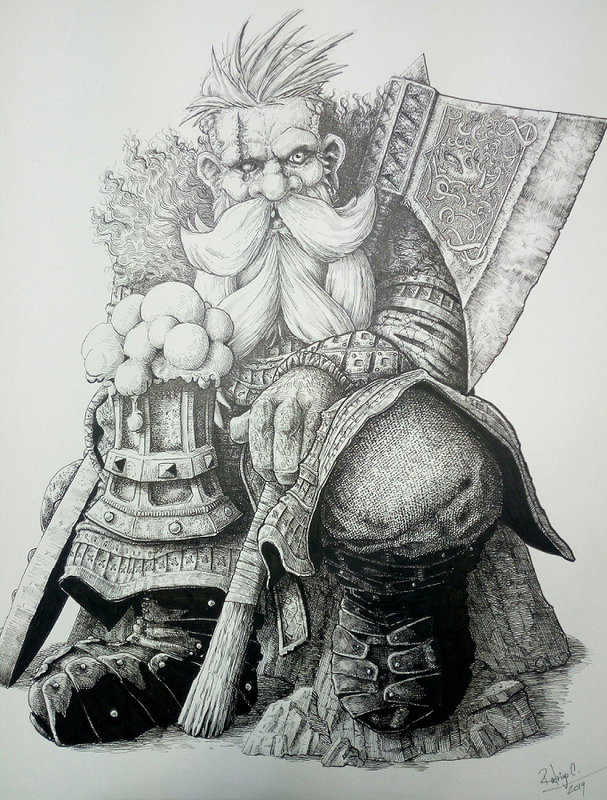 He is allied with a lord draed elves who wants to appropriate the possession of the tree and have immense powers. They imagine a plan to break the alliance between Ukray and ice elves and create wars. The symbol of the alliance pact between the two nations are two swords. To break this pact, one of the two sides must attack and steal the sword or return it to the other. A dread elf, disguised as an ice elf, travels to the Ukrainian capital to kill the king of the day and steal his sword. He hides the sword in a hiding place that an Åsklander disguised as a ukrainian will take later. The dread elf is let kill and accuses ice elves. Ukray declares war to ice elves, joined by the dwarves. 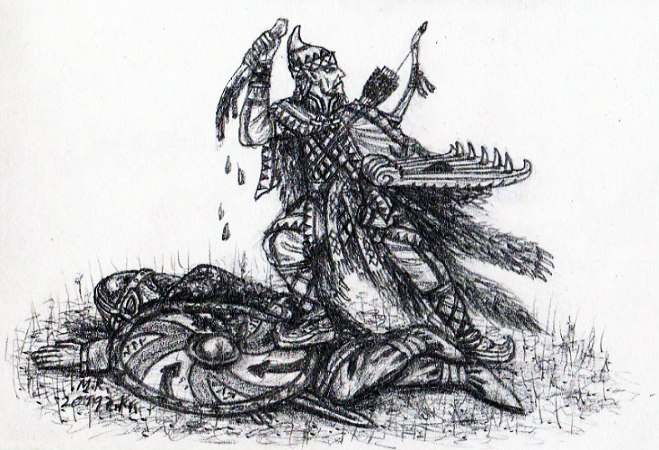 The Boreans elves attack Ukray. The ice elves, thanks to their prescient mage, know the truth but do not stop calming their ancient allies. Meanwhile, an army of Åsklanders, Giants of the mountains, and dread elves gathered for the war. When countries in wars realize it is too late, asklanders and elf dreads attack the land of ice elves and Ukray. 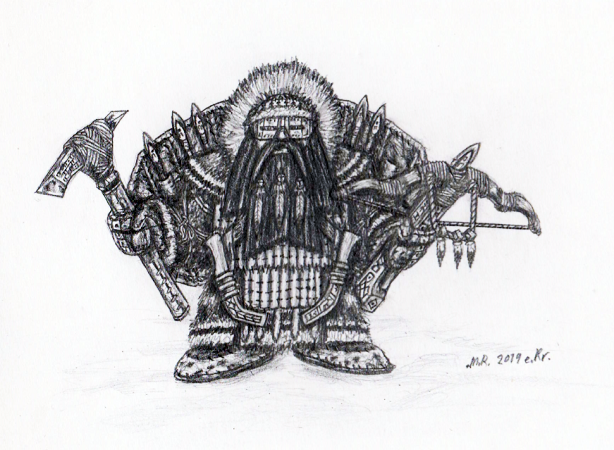 The ice elves, Boreans elves, Ukray and the dwarves will fight together and fight the enemies. The sword will be found on the Åsklanders leader and delivered to Ukray. This event is called the Great Arctic War or Great North War"
Sorry that i am not that active, to much work to do right now. I will try to answer a little bit. Now i am confused In my original proposition i wrote about a daemon of envy. But i envisioned a daemon of sloth behind it all. Kinda like a mastermind, but his plan takes ages because he doesnt like to be rushed. Instead i would name them by the deeds they did and the names the other nations gave them. The Daemon of Sloth could maybe be called 'The waiting one' because the elves know of him, but cant decern his plans because they are too slowly unfolding. Or something like that. So sure. He is waiting somewhere, watching his plans slowly unfold. Pulling a string or two once a decade. Volcano is a little too on the nose evil for my tastes (see Sauron from lord of the rings). I originally envisioned a frozen lake (but then that is Morgoth from the Silmarillion...)... but maybe i just want that, because it fits my own Daemon-Army :DSo sure. He is waiting somewhere, watching his plans slowly unfold. Pulling a string or two once a decade. I understand do not apologize. Thank you for answering me. A demon of laziness, I like it better! This corresponds very well to the icy environment of the north. But suddenly if we exclude the volcano, where to place your lake? I see several places. To know that the Åsklanders must be able to go there but also to make alliance with dread elves. I see the little island under the volcano island, Askland or one of its islands, the North East in troll territory, or in the jotun mountains. We can call it "Den som venter" in norvégien (The waiting one). "because the elves know of him, but cant decern his plans because they are too slowly unfolding." excellent ! The post was edited 2 times, last by HKYUGOK ( Apr 9th 2019, 7:13pm ). Den som venter is an excellent name. But suddenly if we exclude the volcano, where to place your lake? Yes! Now that everything is frozen in the north, it's a great idea! 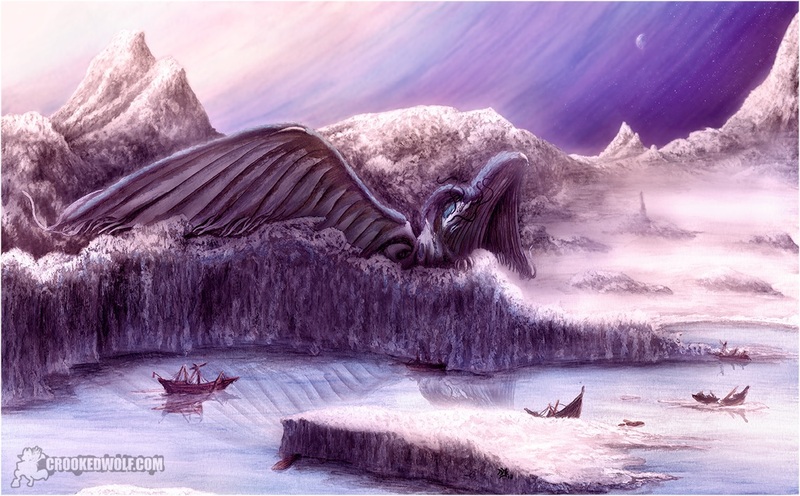 A frozen lake in the crater of the volcano for demon of laziness. He's name is "Den Som Venter" in Åsklander langage (norvégien). I like it ! The post was edited 1 time, last by HKYUGOK ( Apr 9th 2019, 11:22pm ). Very evocative background story! Epic and magical, with some tones borrowed from the Silmarillion. Count me as a fan. I'll think it over some days and maybe then come with proposals, if any, for minor tweaks. 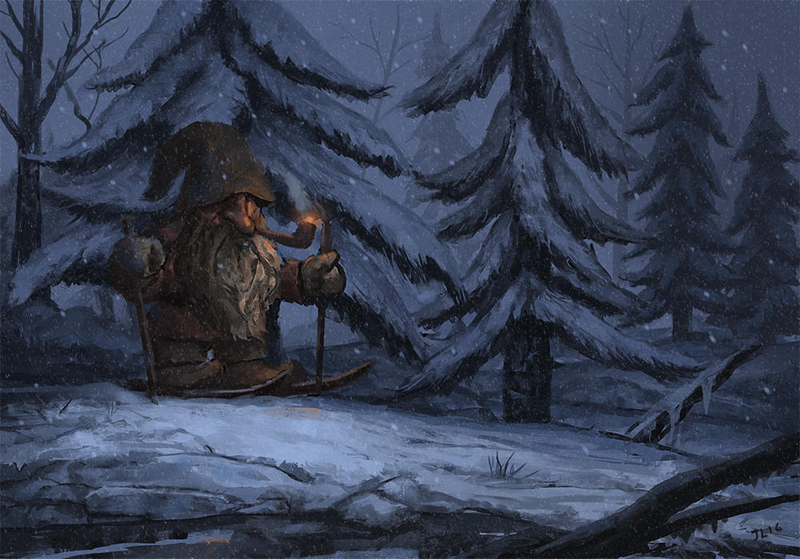 The first thing that stood out to me: I think the northern Humans could be given a mention of seeking safety not only in the mountains with the Dwarves, but also on their own at eg. islands located outside what is today Åskland's coast, and in hill forts. Imagine a warlike Human presence being constant even amid all these ravages of Orcs & Goblins, Beast Herds and Vermin Swarms. With Human raiders prowling the shores, striking inland and from to time risking it by establishing new colonies in a very dangerous milieu. Central Asia, Scandinavia and Arabia (with their different harsh lands and climates) were for long ages the wombs of nations in Eurasia, with a long stream of martial tribes emerging from these regions and spilling out into other lands. As such I think some active and aggressive tribal Human assertiveness is an ingredient needed in the north, even during the most perilous of Ages. Seeking refuge, certainly: But also roaming about, attacking, defending, migrating, settling and being wiped out locally in a maelstrom of tribal violence where Humans participated all the time, even when at their most marginalized. 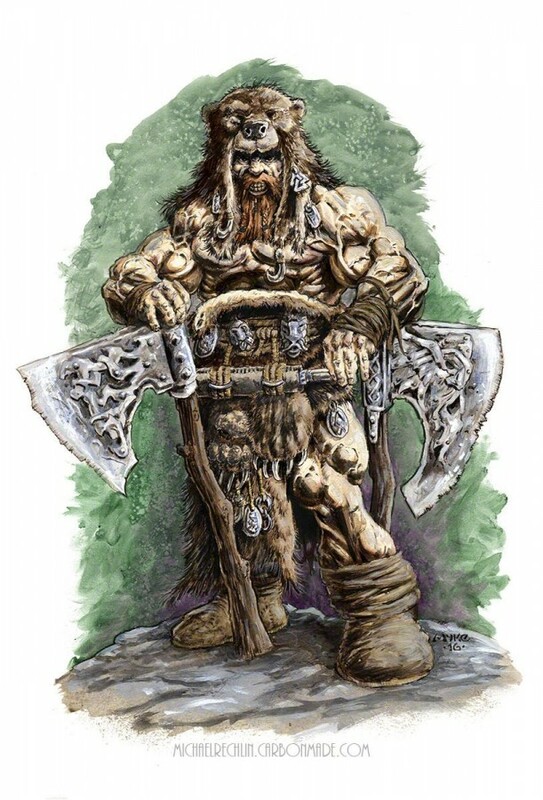 So a hint of this in the over-arcing history, with some northern Humans explictly seeking shelter on their own (while others found it with the Dwarves in the mountains), would do well. We could also have a few waves of both northern Orcs & Goblins and Humans emerging on the unsuspecting southern lands from across the sea. Some initial input. At any rate, great work! It is very reminiscent of the trees of Valinor and even the Noldor elve's crossing over the ice shelf to reach middle earth. I love it for this reason. Genlemen, time for art pool inventory in the frozen north, as we stand at the moment. Might be useful for a more polished presentation later on. I've been given permisson by the kind master Holtzman to pick personal artworks of his for non-profit T9A duty, so this may grow in due time. He has a fantastic gallery and style. The post was edited 4 times, last by Karak Norn Clansman ( Apr 19th 2019, 11:41am ). The mysterious traditional songs of the shepherdesses of reindeer that we call The Lindëmerven, also called Kulning by the Åsklanders. Helcëquendi, be strong !!! Let's help our King to keep the light on this earth !!!" Queen Lossë Marilla, the pearl of the snow, the queen of the ice elves. Yes you're right, thanks for the drawings. Actually later it will be useful to present our work. I invite you all to publish a summary of your fluff and your list of figures in your army book or project (characters, basic troops, special, rare, war beast ...). If you break an image that fits your army you can put it as well if you know how to draw. We will discuss all of this together. And once all harvested we can make a pdf summarizing the north. It's going to take a long time. - the story of the North and Tava Valassë I published a few days ago. 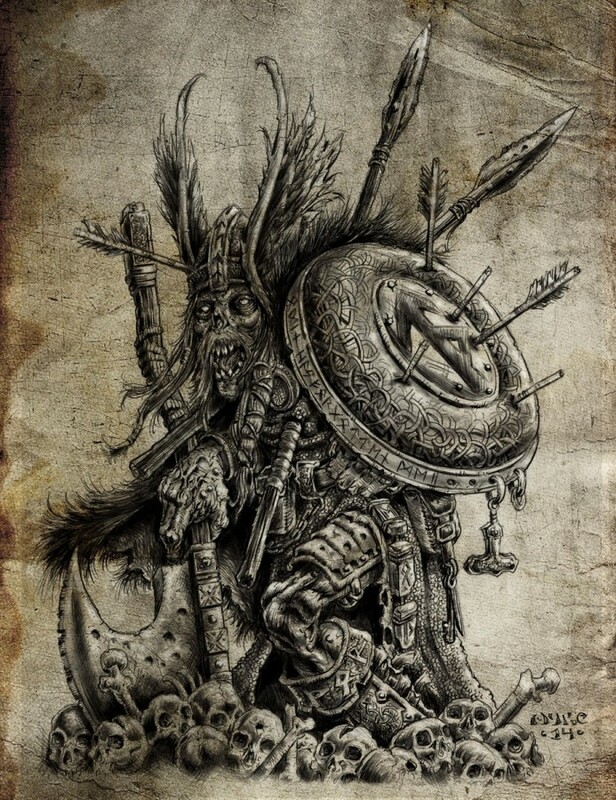 Do not forget to submit the history of your army to integrate it in this story. - the summary of the fluff of all the armies presented in the North Pole. - one or more images for each of his armies. I'd like to add that the Karuit Polar Dwarves remain an open question. Check this out. 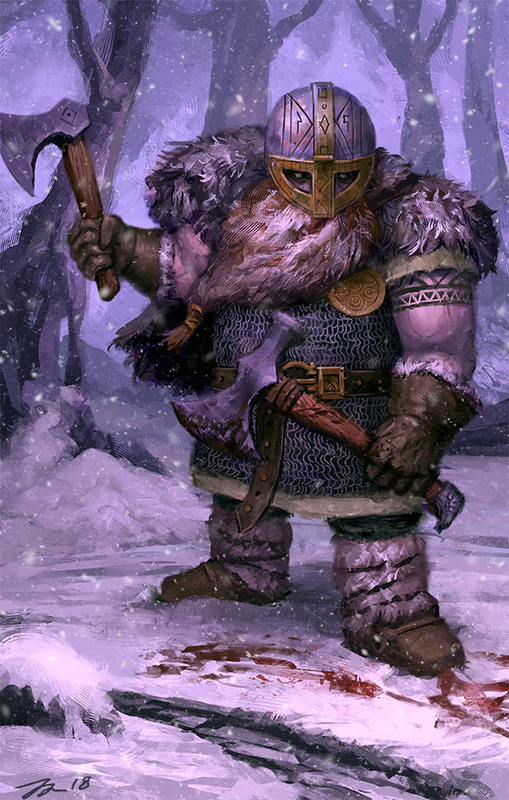 While trading with outsiders for ivory and other wares of the frigid north is a given, it's up for grabs whether they will be uncorrupted Dwarven Holds people as originally envisioned, or Infernal Dwarves on ice. If in doubt, we could keep the Polar Dwarves mysterious to the outside world and mainly touch on their trade relations and conflicts in a not too detailed manner. I'll have to dive into sculpting a lot in the coming weeks and months. Might be more out of the loop, though I hope to join brainstorming again in due time, however briefly. Best of luck, and let the ideas and cooperative homebrew developments flow! Did you really draw Santa_Barbara into this ? I'm just passing along feedback and ideas up and down, left and right, wherever it's of interest and relevant. If it's on the forum or gallery, it's in the open and thus fair game, not confidential stuff. Trying to harvest as many concept ideas from as many persons as possible, whether or not they're into T9A or not. The beauty of having a historically based fantasy setting is that you only need to say e.g. "How about an Inuit Dwarf?" and an artist or background brainstormer who knows little of the setting but has learning and creativity loaded will come up with something which easily can work for such a generically founded setting. Then it will be up for T9A developers or homebrewers to fit amassed ideas in a polished and setting-consistent manner for the end product. Uther on CDO, for example, is into AoS together with his kids, but he has kept up with my updates of new culture concepts for T9A, and has some wacky, neat ideas to share (he and I share the taste for this blank slate opportunity for worldbuilding that has arisen with the end of WHFB; check out his epic AoS creation myth for his Dawi Zharr as an example). I'm trawling widely for creativity. The post was edited 5 times, last by Karak Norn Clansman ( Apr 13th 2019, 2:36pm ). The ideas are very good! This mysterious side is a good idea. The question of whether he is good or bad, I do not know what to answer. We can also have both. 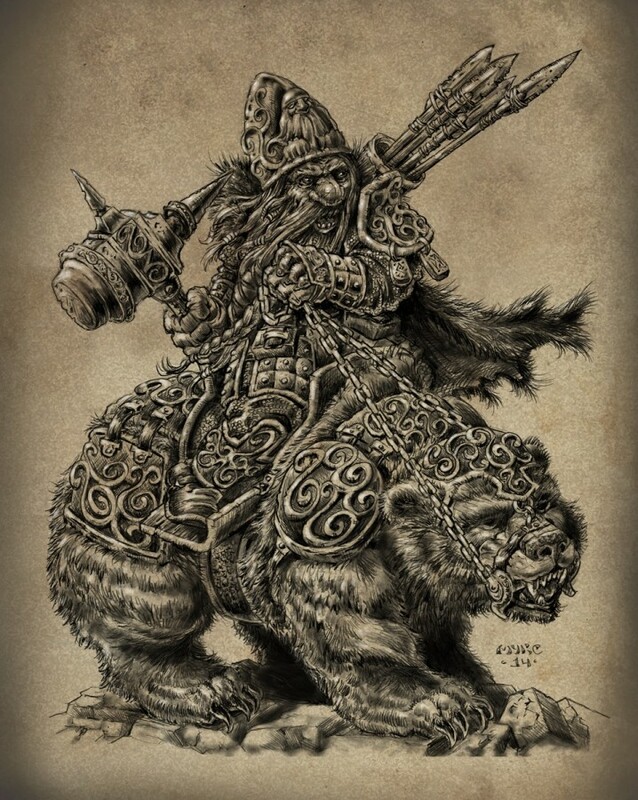 The troops are interesting, Golem and the mounted bear is class! In any case the story pleases me and we can integrate it into the description of this army. The only question that comes to me is about the climate. In the history that I published to you, in the early ages, I speak of a temperate or almost temperate climate in the north. Then the gods made the area very cold, Arctica, to protect Tava Valassë. In the story you just published, the dwarves flee the saurians and head north, which is described as already arctic. Can not we imagine that they first fled north of Silexia and that they also found themselves at the 7th age in the cold and the ice? 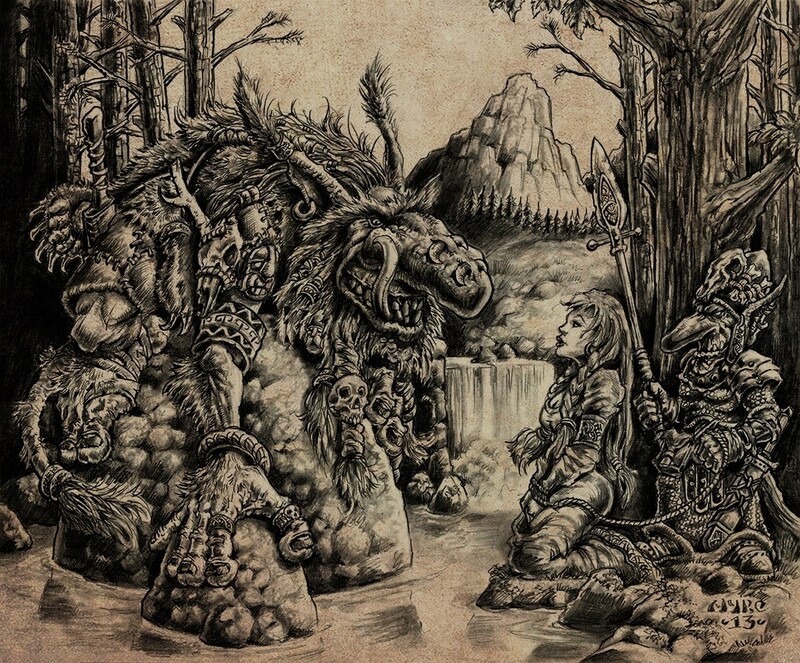 About the Golem, I have one among the Ice Elves, but of a different nature. 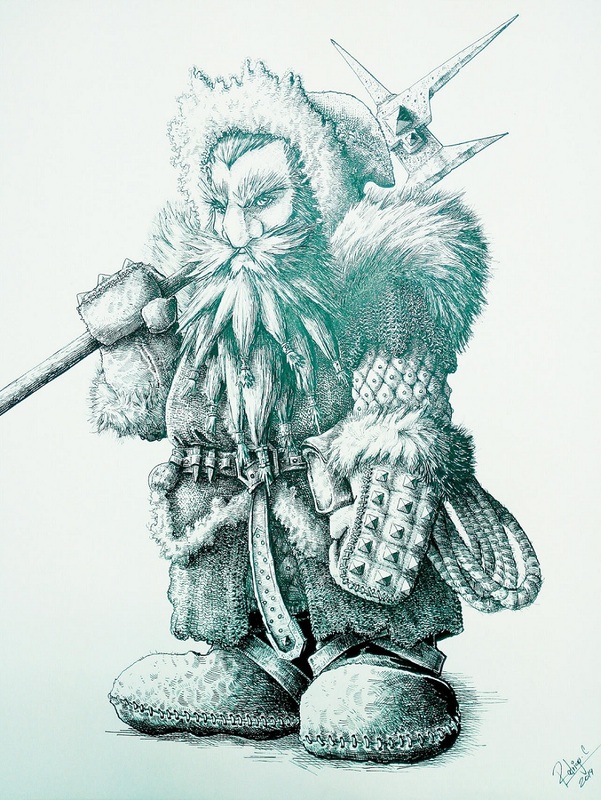 While the one described in the story of the Karuits is made of snow, ice and hate, that of the Ices Elves is made of magic ice and animated by the spirit of a dead elf. With @Ghiznuk, we have not yet released the Ice Elf Troops. I will describe an overview. This magic ice allows magic attack and multiple injury 1d3. In armor this gives protection against magic in addition to the classic armor bonus. This magic ice is also used to create magic mounts and golems. They obviously have multiple injuries and magic defense. This magic ice is formidable. The ice guards are elves with heavy weapons in helcairina and armor in helcairina. In addition to the lightning rules they are terrible enemies. At the same time the ice elves protect the Tava Valassë, their mission is sacred. The post was edited 1 time, last by HKYUGOK ( Apr 15th 2019, 1:37am ). Here's an excerpt from my Ice Elves's fluff about Karuits. Minhelci, the ice city, from the invasion by the ice floes." @HKYUGOK: Nice! As to arctic for their ancestors, we'll simply have to assume they migrated with the north pole to stay in the cold.